A tongue tickling perfect balance of tangy lemon curd. A sweet and fluffy meringue rounded off perfectly with a very realistic pastry finish. Bloody lovely! These guys don't disappoint when it comes to new flavours. A few more have since been added since i tried this one and cant wait to try them out! Lemon tart has that tart taste on the inhale and a biscuit taste on the exhale its so good i wish i had ordered more but have to wait till my next order :D It wont disappoint if your a desert fan. I wont order from anywhere else now as these guys get it right all the time. Never had a bad batch ever. And when i had a problem with an order they sorted it out extremely quick. With fast (next day mostly) free delivery and no waiting around due to the letterbox size packaging you cant lose. Love you guys! This is my last review from my order saving the best til last it seems. 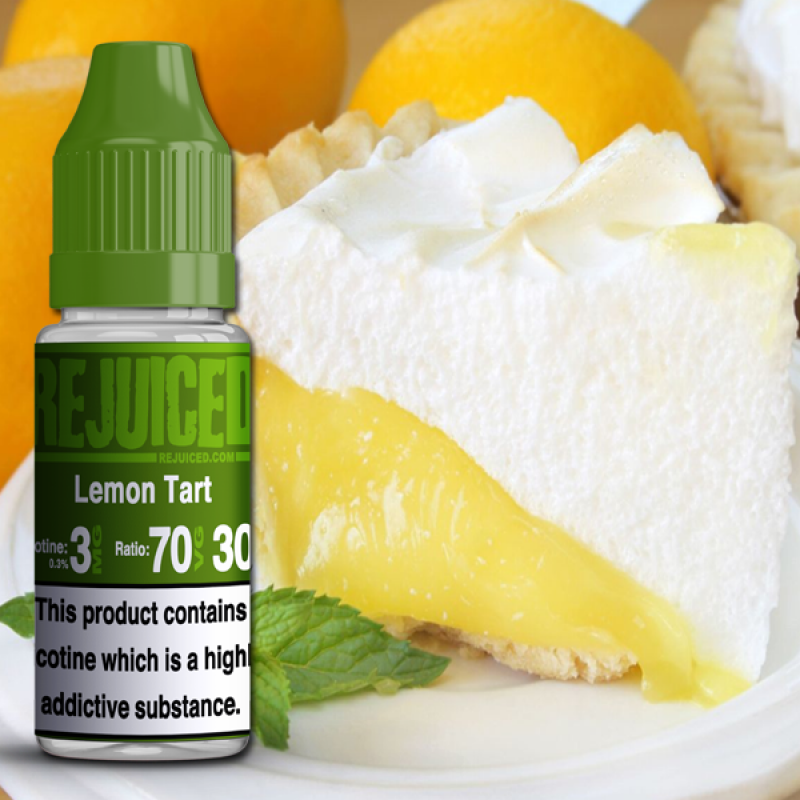 Lemon Tart is a delicious creamy lemon dessert vape though I'd happy vape it all day. Refreshing lemon inhale with a creamy biscuity exhale. Leaves a lovely taste on the palate and is seriously smooth. I can taste lemon meringue pie/ tart another fabulous juice that ticks all the right boxes for me. So that's been Mama's Milk and Cheesecake and Lemon Tart all absolutely fab and highly recommended. Outstanding Rejuiced ! Got my first delivery of this awesome juice today. After trying this flavour by a premium brand at a very premium price! I thought mmm? Lets try it! And all I can say is wow! As good if not better than the juice in this flavour I have tried at more than double the price! Just awesome! Good work Rejuiced! Lemon Tart is a gorgeous fresh taste with a mild biscuit and meringue taste too. Ordered this to try along with my favourite Big Mama's Milk and the other new Lenny banoffee Liquid. All 3 Liquids are gorgeous and you guys at Rejuiced deserve all the praise you get. Well done again. After using mostly fruity-menthol flavours since I started vaping I decided to make the step to try dessert flavours, I've always had that idea in my head that a dessert is something that you eat not vape and if you have too much of it you feel sick, well I was pretty blown away with the Lemon tart eliquid - it was like stepping into a freshly baked cake shop and dunking my head into a lemon tart cake. This has quickly turned into my all day vape already and I am already running low so I cannot wait to place an order again. Fantastic price, flavour and service from Rejuiced, as a first time customer I can't recommend this company enough - you've got a customer for life!! Have tried just about every lemon tart liquid going. Paid 15 quid for 3 10ml bottles of another brand and it was awful!. This is FANTASTIC!!!! The pastry is awesome! My fave part of the flavour, its very well blended. Thank you, its top notch liquid with excellent service and great price. Its the best lemon tart ever made! !